At 6:40 a.m. are already a dozen people in line on this clear, cool morning at a Greenfield polling place in the strongly Democratic East End. Richard St. John is fourth today. He's been first so many times. "I've never seen anything like this," says the 56-year-old small press employee." I can't remember seeing two or three people other times." On the radio, long-time local right-wing talker Jim Quinn is playing an Eisenhower era tape of an American politician warning about Soviet influence: "'We'll keep feeding you small doses of socialism... we'll so weaken your economy that you'll fall like ripe fruit...'" Quinn says, "We almost had that during the Carter administration." Then he plays an Obama line. "This guy sounds more like Stalin than he sounds like George Washington," Quinn says. "Do you realize t his guy raised $600 million? Do you really think all of that came from American citizens?" Hearing the talk on the radio is a disapproving Teresa Russo, 25, who settled on Obama during the debates. "I think that's ignorance  people are just afraid on his part for the change he could bring. He's just different than any other candidate we've had so far. I know in my generation and in older people's generation they haven't had a young black man before. I think it scares the baby boomers." Read "7 Things That Could Go Wrong on Election Day." Iowa: No Longer a Toss-Up? Iowa appears to have lost its toss-up state status, according to a Sunday Des Moines Register poll showing Barack Obama has widened his lead to 17 points here, getting 54% of the vote compared to John McCain's 37%, up from his 12-point lead in September. The Register's Iowa Poll also shows Obama leading by 23 points among all-important independent voters, who make up 32% of Iowa's 2.1 million registered voters (Democrats are 32%; Republicans, 28%.) 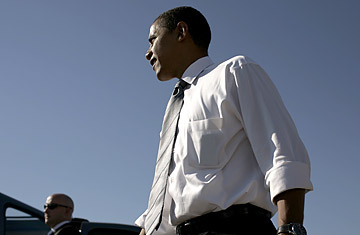 Other recent polls put Obama ahead by 14-15 points in Iowa. If this lead holds, this would be the biggest Iowa win since 1972 when Richard Nixon beat George McGovern by 17.1 points. See pictures of Sarah Palin on the campaign trail.